A24 has had a lot of success releasing smart, interesting genre films that differ from the usual offerings of other, bigger studios. They have done particularly well in the horror/thriller genre with films like Green Room, It Comes at Night, The Witch and The Killing of a Sacred Deer. All of them feel like they are made by filmmakers with a unique vision and a great grasp of the craftmanship of filmmaking. 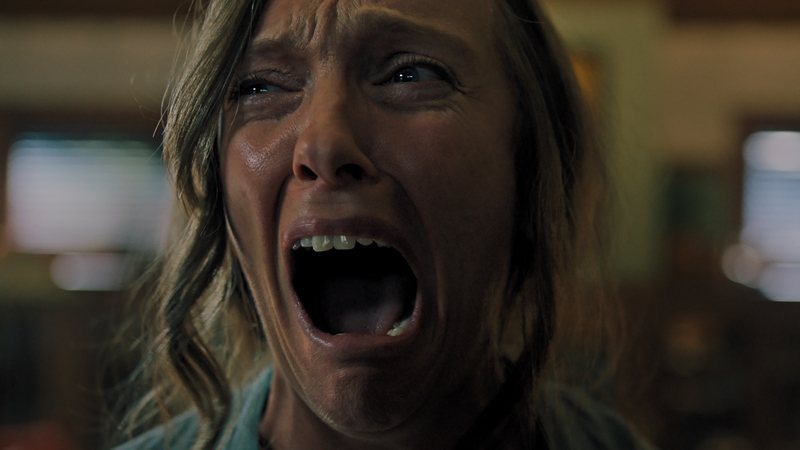 Their latest film comes from writer/director Ari Aster, making his feature film debut and what a debut it is; Hereditary is a superb horror film. 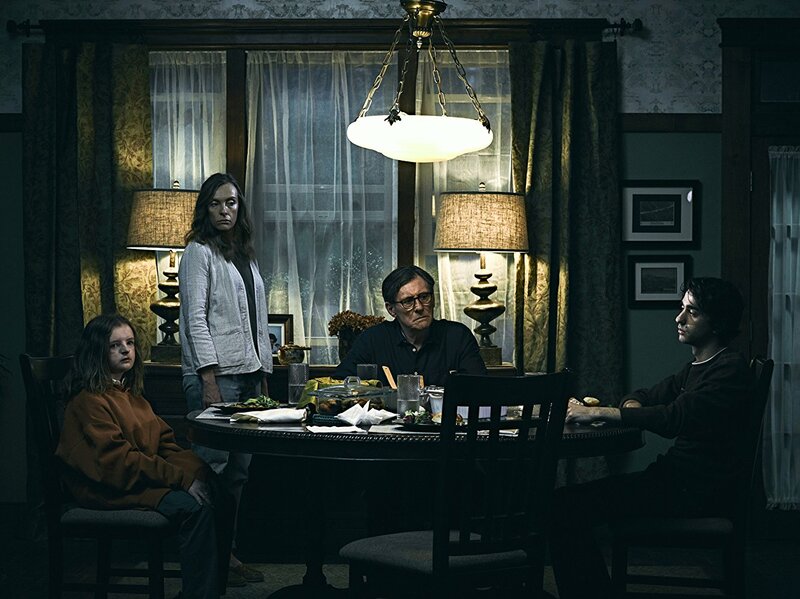 The Graham family of Hereditary consists of mother Annie (Toni Collette), father Steve (Gabriel Byrne), son Peter (Alex Wolff) and daughter Charlie (Milly Shapiro). They have just lost Ellen Graham, their matriarch. After her funeral, strange things start to happen. All of these are connected to Ellen, her past and her parenting. This leads to Annie meeting Joan (Ann Dowd), who tries to help her deal with these events by making her become a medium. The story itself is very simple, despite some unexpected twists and turns, but what deepens it is the subject matter; the story of a family dealing with grief is perfectly written. The family rarely interact, conveying how empty they feel after Ellen’s death this contrasts with the heightened moments of emotion that take place either at random or when other tragic or strange events occur. There is a great dinner table scene that highlights this, as well as other gut-wrenching moments, such as a showcase of grief from Annie that is unbelievably harrowing. The subtle moments also work, like seeing Annie create miniatures out of past and present events to deal with her grief. Whilst the story, once fully revealed, is nothing original, it is nonetheless disturbing and ties the narrative together well. The final 20 minutes are deeply disturbing and go off the wall in terms of visuals and scenes. Whilst some might argue that these horror elements ruin the dramatic elements, I would counter them by saying that both elements are tied together perfectly and compliment each other. The drama never downplays the horror and the horror never downplays the drama. The cinematography is some of the best I’ve seen in a horror film to date, which is only heightened by the overall direction. There is an incredibly unsettling atmosphere in every shot, due to the use of negative space that makes every scene look wide and expansive, almost like the miniatures that Annie is seen creating. The opening shot is especially well done and seamless, as well as being thematically relevant. The atmosphere is only made thicker by the lack of music. Loud noises, orchestra strings and jump scares are not thrown in your face as a lot of the music is downplayed and absent rather than used as a crutch. Ari Aster relies on his genuinely horrific and subtly unnerving visuals, whether it be ants feasting on a body or someone in the corner of a room allowing scenes to carry weight and fear. He even successfully pulls off multiple dream sequences without them becoming tedious or repetitive. There are several eye-catching day-to-night transitions, lingering shots, quick cuts and visual effects that all look great and show clear cinematic potential for his career. The acting is all incredibly good, with lead actress Toni Collette delivering career best work as the emotional center of the story. There are several scenes where she is asked to either act hysterically or speak rapidly. She pulls it off without being over the top. She is equally matched by a creepy Milly Shapiro, a natural and understated Gabriel Byrne and a disturbed Alex Wolff. Wolff is surprisingly prominent in the story and he does an excellent job. Ann Dowd is the only one who feels unnatural, but this choice makes sense as the film continues. As for any issues, I can only think of a couple. As neat as the conclusion is, there is a voiceover within it that feels too neat and explains something that was already clear. Certain aspects of the story are also somewhat confusing in hindsight, which can probably be solved with a re-watch. Finally, as great as Alex Wolff is, his crying could really use some work. It sounds like someone mocking a crying fit and it was ridiculous. 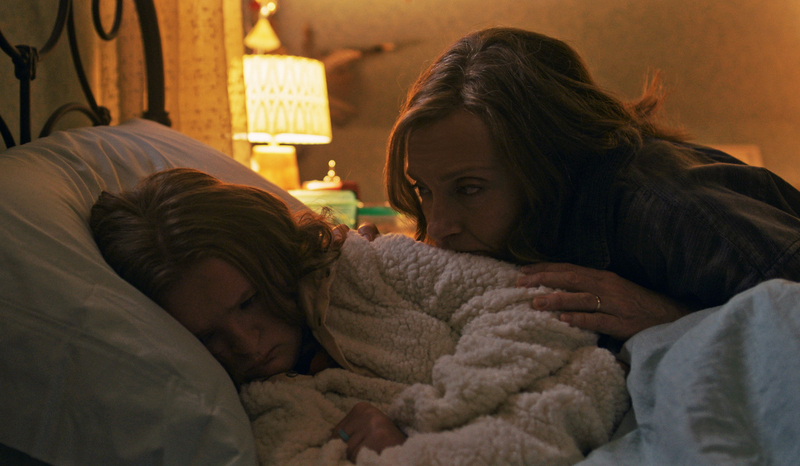 Hereditary is one of the creepiest films I have seen in years, as well as one of the bleakest in tone and theme. The acting is great, the direction is atmospheric, the writing is strong and the overall experience is incredibly uncomfortable. Ari Aster has made an excellent debut feature and one that highlights A24’s great successes. ← Get your brunch on!